Tenatacles on the box... Must be a Lovecraft game. Way back in the mists of time - and I mean way, way back - I was a young man. Naive, adventurous, and a bit geeky. Back then, I met a girl, and if you asked me at the time, I would have told you I loved her. Remember, I said I was naive? She seemed to like me, and we began a "whirlwind romance." We made a special effort to make space in our schedules to spend time together. And it was all exciting and new. But over time, and actually rather swiftly, we started to realise that we didn't really have very much in common. Remember, I said I was a bit geeky? It became more and more obvious that we weren't really enjoying our time together. Now, I know what you're thinking. You're thinking this is a very familiar-sounding story. It's familiar to the point of cliche. And it's familiar, because it happens all the time. It even happens with board games. 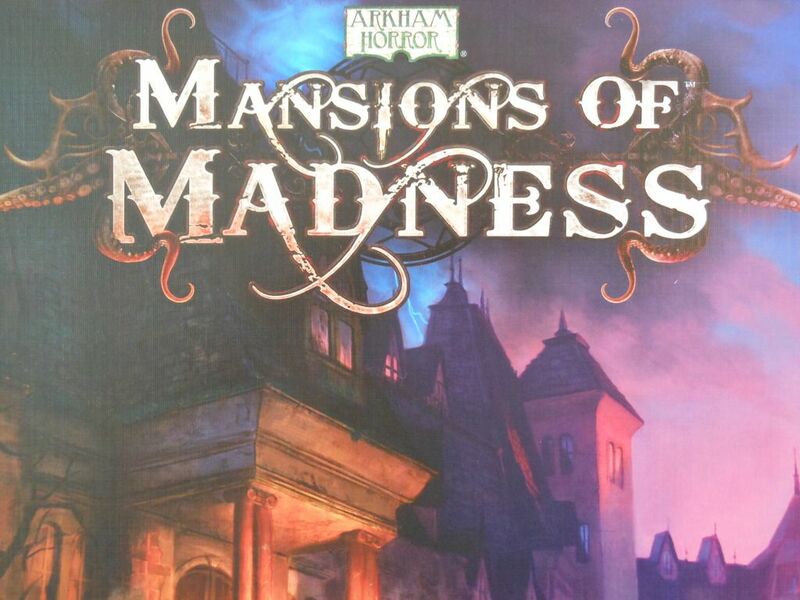 That's why I'm writing this review of Mansions of Madness, a game I actually reviewed years ago, but which I felt the need to revisit. So, let's be upfront about this. 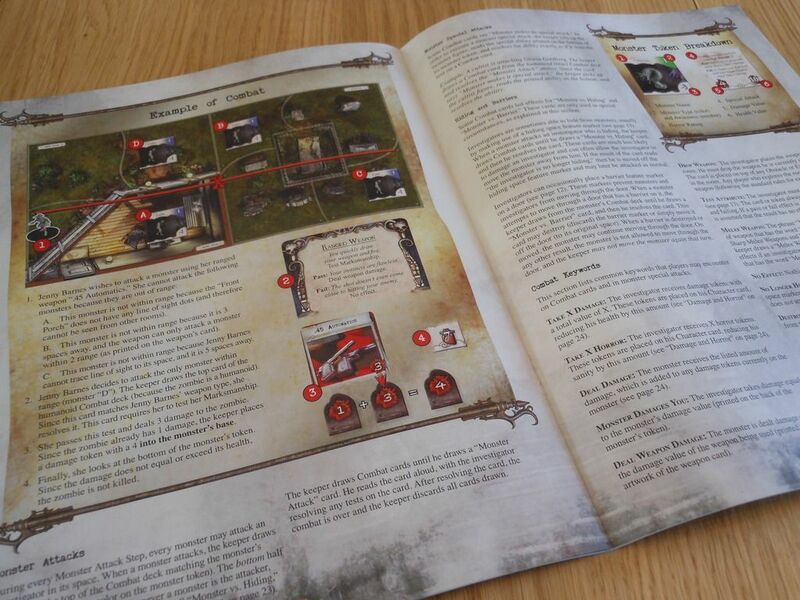 My initial review, while tempered with a lot of misgivings regarding certain design choices, such as the inclusion of miniatures, was positive. I actually sort of fell in love with this game. It was exciting and original, and it combined my love of Lovecraftian horror with my love of storytelling and adventure. It was a huge box of potential, jammed with invention and creativity and... cards... an insane amount of cards. The very first time I played, a group of heroes were hunted relentlessly in a spooky old house by an axe-wielding maniac. It was an absolute joy. I played it with my wife several times in the first weekend we got it. I wrote a fictionalised account of one of our games. I wrote a new set of end clues to add some extra theme. But the game is kludgy. Even then, deep as I was, I knew it was kludgy. I loved that originality. I loved the bold design choices. I loved the way every game told a story, even if you sometimes had to plug a few plot holes with your own imagination. But the kludginess was always there. Thank goodness for Hugo's Amazing Tape. Miniatures that were out of place, stories that didn't quite make sense, incoherent narratives, game sessions that didn't fulfill the initial promise, errors on the cards and in the rules, runaway victories, awkward combat, and a soul-crushing setup time with a built-in opportunity to totally screw up the game before you even started. And always, a general sense that the game wasn't as smooth and streamlined as it should be. A sense that the cogs were turning, but something was gumming up the works. It didn't take long - just a couple of months - for the shine to fade. 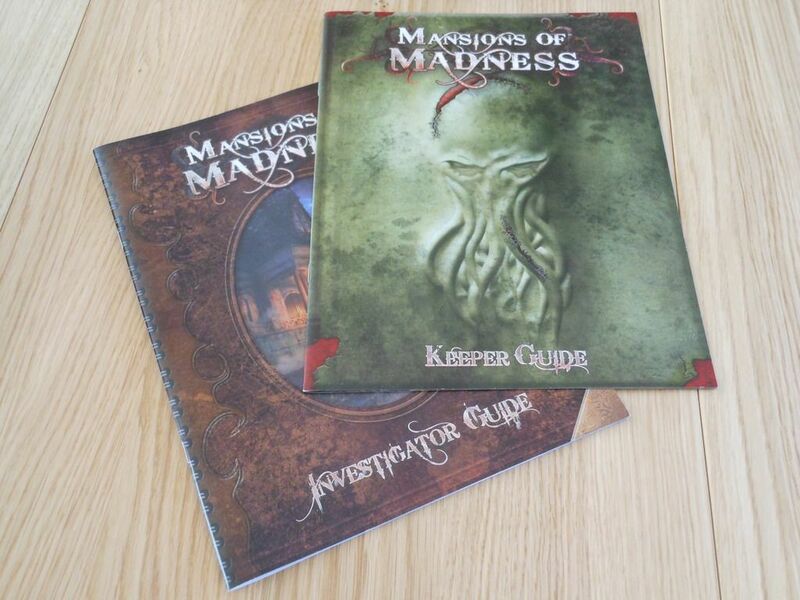 I started to realise that I wasn't really enjoying the time I spent with Mansions of Madness as much as I wanted to. Certainly not enough to justify slogging through the issues I had with the game. 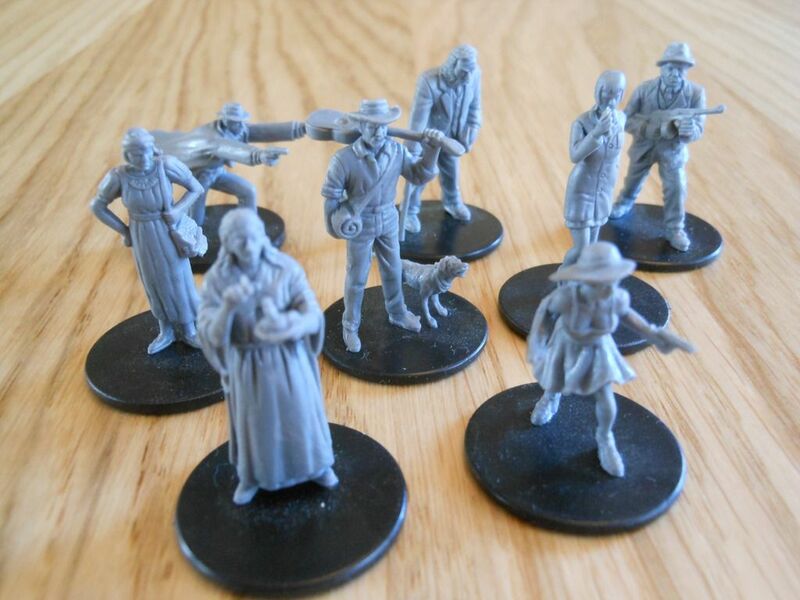 Mansions of Madness still has a place on my shelf, but as I have not played it for a long time, I have to wonder why. 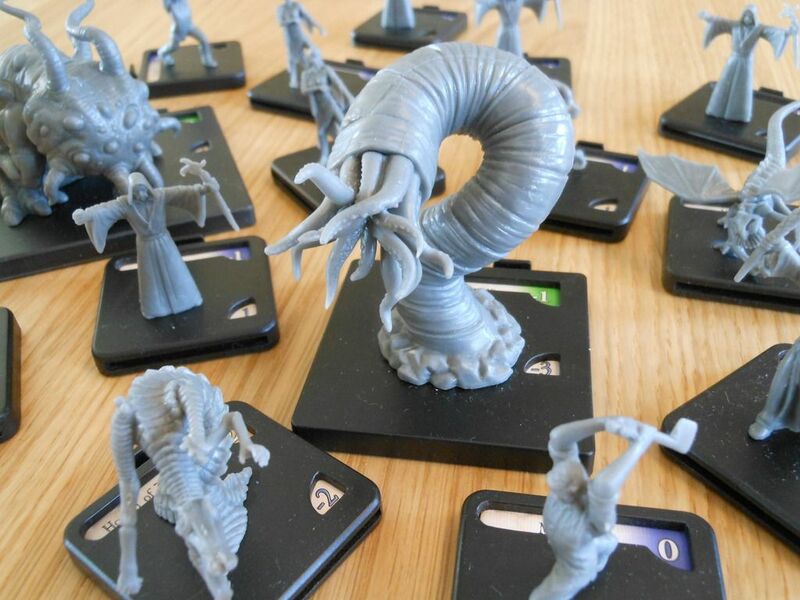 For those of you who don't know, Mansions of Madness is a sort of dungeon crawl, where a group of players take on the roles of investigators solving a mystery, while one player takes on the role of an ephemeral evil presence that has control over hordes of screeching monsters and attempts to forward schemes to destroy humankind. And no, I don't mean Justin Bieber. There, the similarities to traditional dungeon crawls end. The heroes are not going to be rushing into monster-filled lairs to kick the heads off zombies. In fact, in some cases the heroes don't even know what it is they are trying to do. They get a small snippet of information, setting up the story, and then it is their actions - their investigation - that progresses the narrative. This is achieved by finding clue cards, which are mixed in among other facedown cards scattered around the board. Each clue points towards the next, and eventually reveals the grand scheme. Will you be closing a portal to prevent an alien entity sneaking through, putting lost spirits to rest, or battling a coven of witches? Effectively, what you have is a race. The investigators have a certain time to reach all the clues, while the evil player throws as many speed bumps at them as possible. 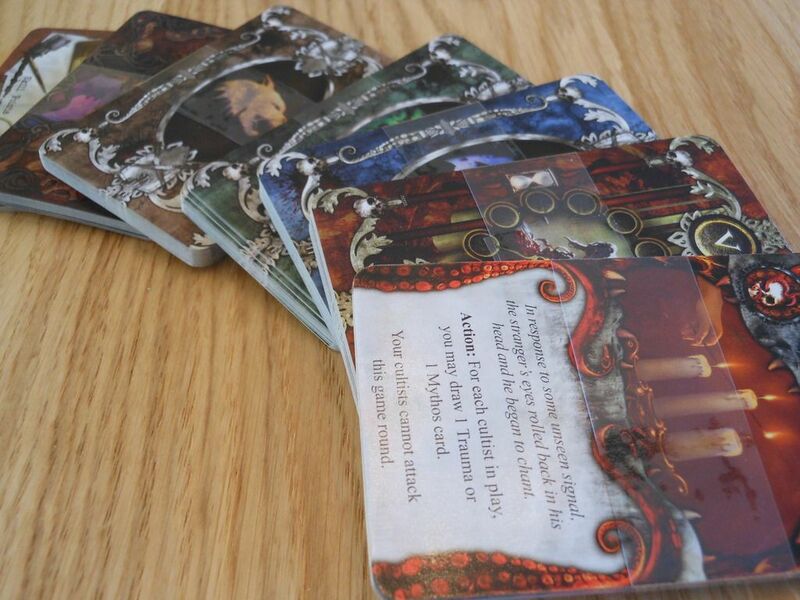 Monsters, mythos cards (supernatural events), and a constantly ticking clock are the adversaries; and in the later stages of the game, the sense of tension and rising dread is palpable. "Some people have complained the clues are too easy to solve, and they basically tell you where to go next (for example, a clue might say "has someone left the kitchen stove on?"). The clues aren't supposed to be hard to solve because they're only called clues to keep the game thematic. They are objectives that must be reached. Each turn you have to make a decision - go for the objective (the next clue), or explore somewhere else in the hope of finding something useful (like an axe or a pistol). 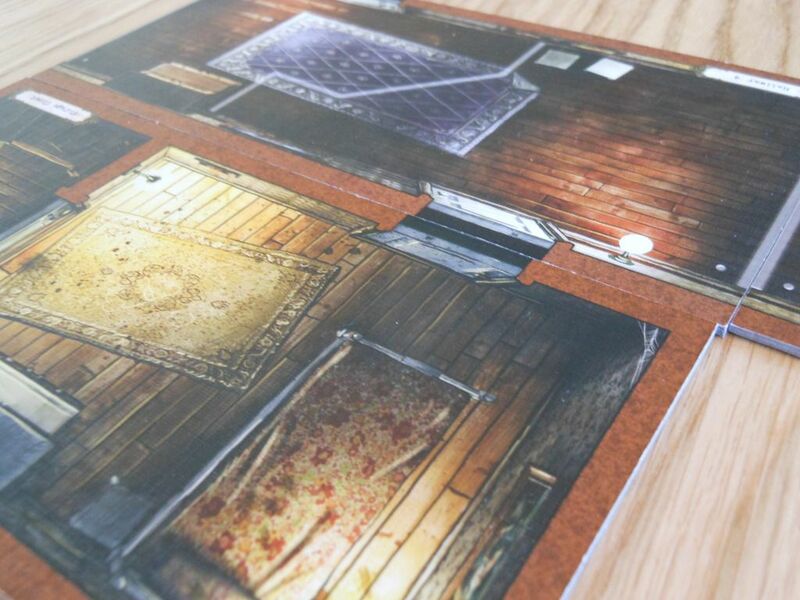 Clues in Mansions of Madness aren't clues that need to be solved in the same way that the gates in Arkham Horror are not clues that need to be solved. In Arkham Horror you know where the gate has opened, and you know what you need to do to close it. Same rules apply here. You always know where the next clue is, and you always know what specific item you will need to get to it (such as a key or a password)." It is fascinating to cross the threshold of a new adventure, to find the first clue, and then to delve deeper into the darkness. It is exciting and fun to watch the story unfold. It's dramatic, thematic, and everything I love about boardgaming. But I just wish the game wasn't quite so bloated. As I get older, more and more I appreciate games with lean rule sets that do not mistake clutter for depth. Space Hulk, Claustrophobia, Assassinorum: Execution Force, Betrayal at Calth, Lords of Waterdeep, Fireteam Zero, Tash Kalar... They are all games I can teach in minutes, yet they offer compelling gameplay filled with interesting choices. They don't have hundreds of tokens and dozens of decks of cards to sort. They don't rely on poorly-written fluff to create thematic immersion. I can't say the same for Mansions of Madness. And before I go on, I need to make this clear: Mansions of Madness is not a bad game. It really isn't. Setting up the game involves flicking between two different books. You start by creating the mansion from a bunch of double-sided cards and dozens of little tokens like blockades and ladders. Once you have done that, the evil player has to make a series of choices about the adventure, and then seed a deck of clues and items based on those decisions. Then the evil player has to correctly place those cards in a predefined order in predefined locations for the heroes to find later. Then the evil player sets up the deck of event cards, which is an exact sequence of cards that trigger at certain points during the game, acting like a countdown to doomsday. Just thinking about the setup involved makes me lose the urge to play. And if you get it wrong... If you put the wrong card in the wrong place... Well, you just screwed the game. You screwed it in a way that may not be apparent for several hours of playing. But if you get it right... Well, it all just gels. And it gels beautifully. 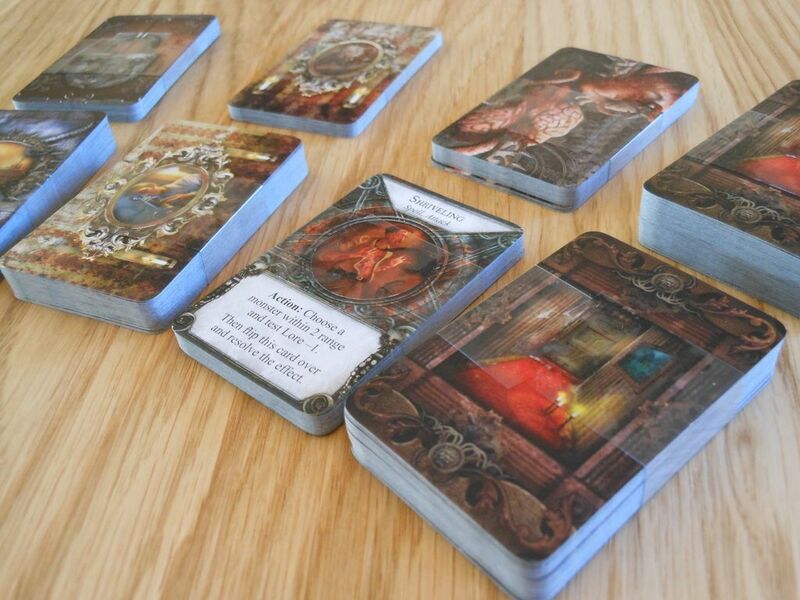 Heroes move into a room with facedown cards, and they work through the deck from top to bottom. For example, the top card may be an obstacle like a locked box. If the heroes have a key, they can then remove the locked box card and flip the next card in the stack, which represents the contents of the box. Unfortunately, in and around the simple core at the heart of the game, is all that kludginess I mentioned. The beautifully presented but rather cumbersome rules. Combat involves an odd card system, where you flip a card relating to the type of monster you are fighting. You flip these cards until you find one that matches the type of weapon you are using, and then you make a relevant skill test and read out what happens. It creates interesting moments of story, but it is also a bit long-winded and unnecessary. You can spend quite a bit of time flipping cards to find the right one, and I can't help thinking it is trying too hard to inject the theme into the game, whether you want it or not. I mean, great: I draw a card and it tells me my gun jams, and I have to desperately get the firing mechanism to work by testing my dexterity. If I succeed, I shoot the monster; if I fail, I get bitten. That card has created a little vignette, but at the same time, it hasn't really done anything that couldn't simply be achieved by rolling a dice. I have a good imagination. If I roll a dice to shoot a monster, and I fail my roll, I am quite capable of creating my own little story to explain how I flubbed the roll. I do that in every damned game I play. If anything, the cards create a barrier to immersion. They loudly and proudly proclaim, "No, this isn't your story. This is our story. We are going to tell it the way we want to tell it, and you lot are just coming along for the ride." Mansions of Madness also uses an interesting puzzle system. If the heroes find a puzzle to solve, then the players actually get a physical puzzle to solve. For example, you may go into a dark room, and have to solve a puzzle to rewire the lighting. You get a number of tokens showing different coloured wires, and you need to arrange them to form a continuous circuit. Until you solve the puzzle you cannot search the room. When I first bought Mansions of Madness, I thought this puzzle concept was pure genius. But now... Well... I'm not so sure. I think there is a good reason why this sort of test is usually abstracted out into a dice roll against a character's "intelligence" statistic. Doing a simple sliding puzzle once or twice is a nice novelty, but after a while it just starts to feel intrusive. Eventually, the puzzles become an annoyance, bogging down the game as the evil player sets up the correct tokens, and then slowing down the experience as the players ponder how to solve them. I still think it's a clever idea. I just think it's an even cleverer idea to use a system that is streamlined, requires less fiddling around with little tokens, and plays out faster. There are other issues, too. I never liked the miniatures. They are too big for the board spaces, and each one has different statistics and special attacks (even the ones that look the same!) so you have to find a way to randomise them before putting them into play. I have always believed that using tokens without the miniatures would be better. Watch out, you've got worms. But really, the biggest strike against the game, is the sheer amount of "stuff" you have to deal with in order to play. Setting up the characters, setting up the mansion, choosing the story, seeding the decks, constantly shuffling decks, swapping tokens in and out of play: the list goes on, and that list is just filled with things that prevent me getting this game to table. It prevents me from even having the desire to get it to the table. And if I had to categorise a game I don't have any desire to play, I would have to categorise it as a failure. 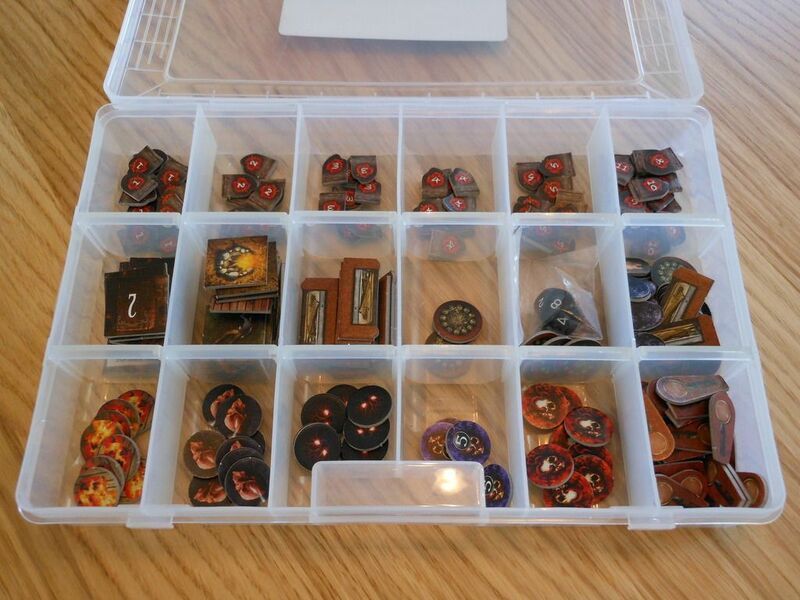 Loads of tokens in a sorting tray... This must be a Fantasy Flight Games product. So, why does Mansions of Madness still have a space on my shelf? Because of what it stands for. Because of what it tried to achieve. Because every game is a story, and I love stories. Because there is nothing else quite like it; and because there may never be anything like it again. Because all of life's failures should be as spectacular, groundbreaking, and fascinating as this one. Because it's a beautiful monstrosity, wearing its flaws like scars, and holding its head high with every sluggish step it takes towards greatness. And because it's just like a childhood romance. It's messy, incoherent, confusing, and complicated; but it's also wonderful, and something you are never going to forget. 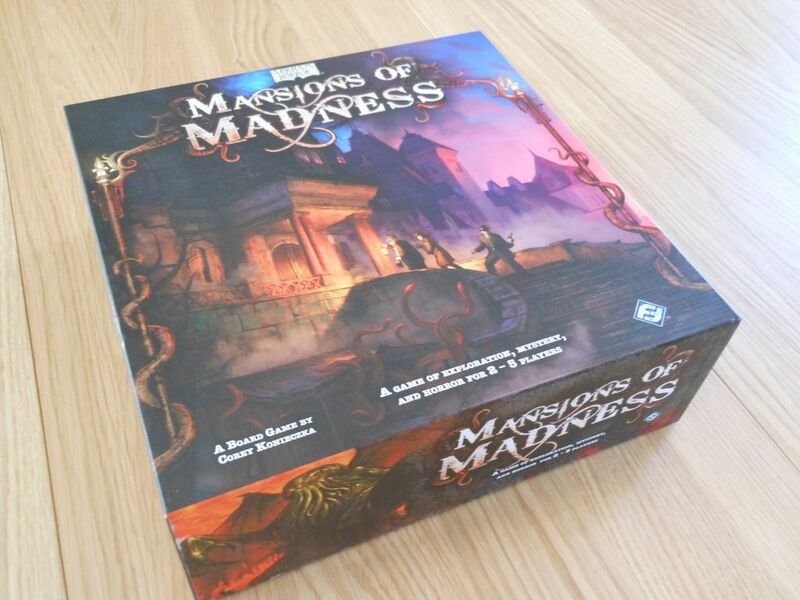 Ultimately, Mansions of Madness keeps its space on my shelf because it is a flawed experiment that reached too far, set its sights too high, and descended into chaos. How much more Lovecraftian is it possible to be? We played it once and decided that we'd rather play Call of Cthulhu. Funny thing... despite my love of storytelling, I don't play roleplaying games. But if I did play a roleplaying game, it would be Call of Cthulhu. Excellent review that sums up my thoughts on the game perfectly! I love so much of what it's trying to do, and at times it works, but not often enough. While I did sell my copy in the end I only did so because my friend wanted to buy it, allowing it to stay in the board game "family". Seeing as you also enjoy Sherlock Holmes I'd like to recommend Mythos Stores (aka Arkham Investigator) that is being kickstarted right now. It's Sherlock but set in Arkham. This of course intrigued me but it wasn't until I tried the first case (available for download) yesterday that I realized what a great experience it is! Apart from actual roleplaying, playing Mythos Stories (even solo!) is the closest I've come to emulating that Lovecraft feel. And it was so invigorating to have a Lovecraft experience that _didn't_ include lots and lots of monsters, combat and other pulp elements that were never part of the original stories. Highly recommended board game in this age of "peak cthulhu". I have already checked out Mythos Tales (dislike the new name, but I understand why they had to do it). As you rightly guessed, it is something that looks perfect for me and my wife. Unfortunately, there are a few reasons why I don't intend to back. 1. I am still waiting on two Kickstarter projects, and I don't intend to get involved with any more unless they are exceptional. 2. The unknown shipping, which could be up to $30, is something I'd rather not deal with. 3. I don't want a hardback book. I am hoping the retail version splits the cases up into individual case books, like in Consulting Detective. It makes the case books easier to handle and pass around, and you are less likely to flick to an incorrect section. I do agree it is refreshing to see the theme applied to a game that doesn't involve a nun with a Tommy gun riding around on a motorcycle shooting shuggoths as they jump out of portals on the grounds of Miskatonic.